After baking the Make-Ahead Brownies, I started thinking about how I would really like to have that same flavor with a more custard-like texture. So I flipped through a few baking books, looking at the ratio between flour and liquid, and tried to find the right amount of milk to add to get that soft, spoonable pudding texture. One or two test bakes later, I got it just right. I even got a delicious, crispy crust floating on top of the warm brownie pudding- and it doesn’t get any better than that! 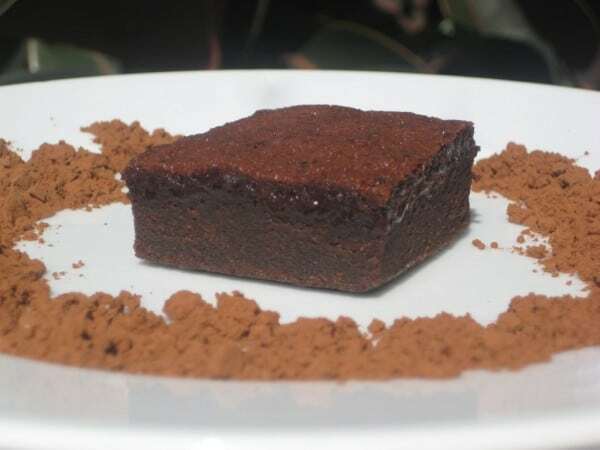 This warm, spoonable brownie pudding has a delicately crispy crust floating on top of a luxuriously soft interior. Super easy to make! Cut out a piece of parchment paper to fit the bottom of an 8 inch square pan. Prepare a water bath for the brownie pudding by filling a 13 by 9 inch pan about 3/4 inch high with water. Place 13 by 9 pan in oven and preheat to 325. In a large bowl, whisk together flour, cocoa, baking powder, and salt. In a second bowl, whisk together warm milk, melted butter, and vanilla. Whisk in eggs, then whisk in sugar. Slowly add the wet ingredients to the dry and whisk together until smooth. Pour into 8 inch square pan. CAREFULLY place the 8 inch square pan into the 13 by 9 pan water bath. Bake about 45 minutes, or until a toothpick comes out with a few moist crumbs attached, but no wet batter. Let cool about 15 minutes. Serve warm. The water bath is crucial to the soft, even texture of this brownie pudding. Trust me: don’t skip it! This brownie pudding’s crispy top crust is a perfect counterpoint to the pudding-like texture of the soft, buttery interior. It is lush, rich, and most definitely should be served warm- the crispy crust stays crispy only for a little while, before the steam of cooling off completely softens it. Also, this was my first time baking with Ghirardelli Chocolate Unsweetened Cocoa Pouch, 8 Ounce . I was impressed with the flavor and will definitely use it again. When this brownie pudding is refrigerated, the butter will congeal slightly, forming small yellowish white spots. These will melt upon warming. A fantastically textured variation on a brownie. This brownie pudding is easy, unique, and delicious. I can see why they favourited it! Seriously Katie, you’re killing me with these brownie creations!! This is going to be right on top of my list (Hopefully this weekend!!!) YUM-MEE! Hope you enjoy the brownie pudding! 1) I substituted whole-grain sprouted spelt flour, and used a Tbsp. less. 2) I used Sucanat and reduced the total sugar by 3 Tbsp. 3) Since I reduced some of the dry ingredients, I reduced the milk by a couple of Tbsp. as well. 4) I used vanilla powder instead of extract, and doubled the sea salt. 5) I used a round metal pan for the water bath, and it was only half as deep as what you recommended in the recipe. 6) I baked this in a large toaster oven on the convection setting at 250 degrees for about 37 minutes. Even with all these tweaks, it turned out great. Thanks so much for the recipe! Hey Sam! That is awesome! 🙂 Thank you so much for sharing the tweaks and how it turned out. I always love to hear about that! Happy Valentine’s Day!